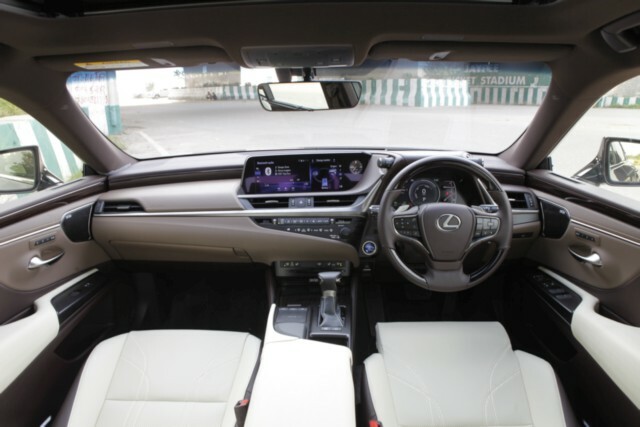 The all-new Lexus ES 300h juxtaposes an edgy and stunning exterior with a smooth and relaxing interior. How does it fare in the real world? We driven it hot out of the oven. 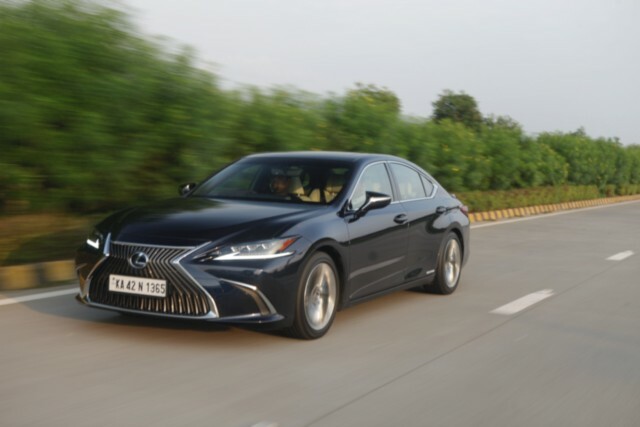 As the wraps came off in Beijing earlier this year, the new, seventh-generation Lexus ES arrived, making a statement in many minds with its bold new styling. It may be larger, but, in a bid to replace both the ES and GS, the new ES sports some thoroughly alluring styling reminiscent of the larger LS, with sharper lines like a fine pressed suit, and a more pronounced sloping roof. More than anything, it’s the new spindle-grille that stands out – and not remotely in an unwelcome way. The parting of the air spearheaded by this number means it not just looks great, but is also functional. Flanked by those Bi-Beam three-eye LED headlamps with lightning-bolt style daytime light strips, the front end brings the ES into the future by one giant leap. The lines, too, are pronounced but not too bold. Yet, the ES appears lower and sportier. The lines flow rearwards well, swooping in waves to exude a certain elegance along the side profile. The sharp LED tail-lamp clusters have a distinct light signature. Sizewise, the car is 65 millimetres longer and is now closer to five metres long. It’s built on the new GA-K (Global Architecture-K) platform for front-wheel-drive models. 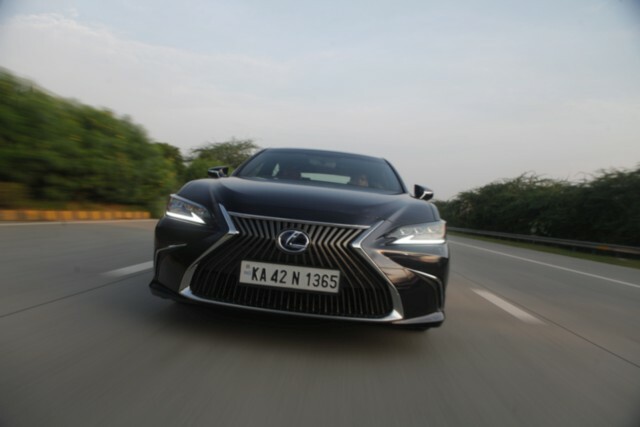 Lexus say that is just as strong and rigid as the GA-L that underpins the rear-wheel-drive LS which we drove this past March. The lower centre of gravity and stiffer, reinforced construction make for a good base. Rigidity is one thing, and capable suspension is another facet of the handling diamond. And Lexus have done their bit there, too. A MacPherson Strut front and multi-link with trailing arm rear suspension is tuned for even better response. While the front set-up is from the previous car, there have been many changes made to improve upon it considerably. The angle of the strut has been changed to better align it with the load path from the lower control arm to improve ride comfort. Secondly, altered the caster angle and trail helps improve straight-line stability. The Dynamic Control Shocks in the rear set-up are new as well and respond to even the tiniest movements thanks to smart management of the oil in the dampers. The resultant ride height is a usable 152 mm; enough ground clearance for a car of this calibre. Partnering the smooth ride is another key element: sound deadening. Lexus have padded pretty much the entire underbody and paid special attention to potential spoilsports. For example, the aluminium wheel rims have been created with a resonator function and help disperse the high frequency vibration from the air in the tyres by turning it into dissipating heat. That is also a first for Lexus, is what we’re told. The plush interior is a complete contrast to the almost aggressive demeanour the exterior design lends the new ES. Key elements are, as expected, the materials used and their high quality finish. The artfully-crafted Shimamoku wood trim that adorns the dashboard, console, doors and steering wheel is available in a choice of two colours, with a Bamboo option available, too. The leather upholstery is also available in four colour themes. Our car had the “Rich Cream” treatment. The climate control is three-zone and uses nano e negative-ion technology for maintaining optimum air quality, something much needed in many metros today. The centre console also houses the full-colour display and an input pad – which takes some getting used to. Connectivity is taken care of well, too. Then, there’s the Mark Levinson premium audio system which packs a mix of 18 speakers, tweeters and woofers with a decompresser that recreates almost live performance-like vibrant sound quality. Get into the driver’s seat and there are 14 ways to adjust it, including power-adjustable support for your thighs and four-way lumbar. Comfortable indeed. The front passenger seat also gets a 12-way set-up, with the thigh-support omitted. Understandable, because the ES, more often than not, is going to be chauffeur-driven. The rear seat is where the comfort seems even more focused. The longer body has lead to more room, and the seat-backs now recline as well. The side windows, quarter glasses and rear windscreen all have sun curtains, and the centre arm-rest puts every control at your fingertips. The side of the front passenger seat has control to move the seat-back, or the whole seat forward to free up even more stretching space. The rear promises sleep-inducing comfort and, the more time you spend in the car, the more evident its relaxation-boosting levels become. I had no intention of dozing off and was eager to hit the open highway.